Sandra Bullock, Cate Blanchett, Rihanna, Mindy Kaling, Awkwafina, Helena Bonham Carter, Anne Hathaway and Sarah Paulson ride the train in the first look at the upcoming film. Rihanna took to Instagram on Monday morning to provide the first look at the upcoming Ocean's 8 movie, coming to theaters June 2018. The promo picture features the all-woman cast — which includes Sandra Bullock, Cate Blanchett, Rihanna, Mindy Kaling, Awkwafina, Helena Bonham Carter, Anne Hathaway and Sarah Paulson — taking a leisurely ride on the subway. 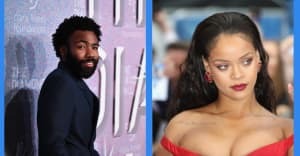 The picture gives some hints as to the characters portrayed in the movie, with Bullock and Blanchett sporting high society looks, while fans have speculated that Rihanna's character is some sort of computer hacker based on paparazzi shots from the set. See the first promo picture from Ocean's 8 above.